SUTA & IAUT are proud to announce they have organized another exciting event, a 2-day 3-night Camping and Water Rafting trip on Ottawa River with optional side trips to Bon Echo provincial park, Bonnechere Caves and Ottawa. Carpooling: 8 am at Villaways Park (East Don River park) parking lot at North-West corner of Leslie and Sheppard (across Leslie subway station). If you need a ride or can give rides to people in your car please contact Morteza Tehrani, the event coordinator, at 416-826-7814. - Package includes a full river rafting trip in a 12-passenger raft on Sunday (August 2nd), 2 nights of camping, 2 breakfasts, 1 lunch, 1 dinner and a resort day to enjoy as you please (beach volleyball, swimming, Canoeing, Kayaking, ...). - It's possible to hang out with the group, camp and don't raft. You have to buy the non-participant package. - We will have waterproof camera to take picture while on the river. We will provide all the digital pictures and the Video of the rafting on the river for every person buying the High-Adventure package. Everybody has to pay for the package ahead of time by cash or cheque or through e-mail money transfer. No seat is booked before we receive the payment. 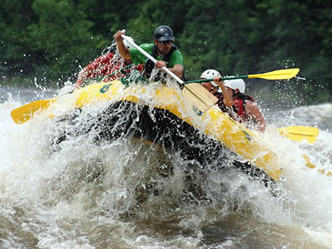 1- Resort Weekend – High Adventure Rafting: Discounted price is $215 per person. Package includes a full river high adventure rafting trip in a 12-passenger raft, 2 nights of camping, 2 breakfasts, 1 lunch, 1 dinner and a resort day to enjoy as you please. 2- Non-participant package costs $129. for two nights of camping and 4 meals. $6 per night service charge plus 13% HST and will apply. Total price will be $159.33. 3- Carpooling: If you are not providing your own means of transportation, you have to pay $60 directly to the driver who provides the ride to you.It will be a 1,100 km long trip (return trip including all side trips). We will organize for 4 or 5 passengers in a car depending how big the car is. Note: Full Camping & Rafting (High Adventure) package is discounted but the discount does not apply to the non participant package. Full Camping & Rafting package includes the extra benefits such as rafting, waterproof camera photos, resort and side trip photos, video of the rafting trip and a DVD package containing all the photos and videos. Please be advised that the spots fill very fast at the resort, so you have to register as soon as possible to avoid disappointment. Usually they are fully booked two weeks before the rafting day, and sometimes three week before. We have booked a 12-passenger raft and are registering the first 12 people, and will book more spots as we get more people registered. We expect to close the registration by mid July or as soon as the resort runs out of spots. To register, please call 416-826-7814 or e-mail morteza_tehrani@yahoo.com to arrange for the payment. You can mail a cheque, pay in person or pay through e-mail money transfer. Due to the fact that we have to pay for the package 4 weeks before the event, the only way to cancel is to find a replacement for your spot. We will try to find someone for you but it's not guarantee. You probably have to find a replacement yourself. Travelling long distances and outdoor activities including (but not limited to) camping, water rafting, hiking on uneven trails, climbing, canoeing and swimming in open water involve risks of injury and/or loss/damage to properties. By participating in this event you waive and release any and all claims for yourself and people you bring to this event against the organizers of this event in conjunction with any injury, illness, or death, or loss or damage to property, which may directly or indirectly result from your participation in the event. You acknowledge that you will not receive any financial payment for any of the above and that your compensation is the opportunity to participate in the event and contribute to the activities of the event. You warrant that you are fit to participate in this event and your attendance in the event means that you admit the Agreement.